Power washers come in various sizes to fit any cleaning job for both residential and commercial purposes. They range from light, portable ones that you can use for projects at home to very powerful commercial machines that can be used for large jobs. Residential uses: there are many uses for these machines at home. Gutters: This is a chore that nobody likes doing. Standing on a ladder clearing all the debris from the gutters can take a long time and be very back breaking. However, with a Power washer you no longer need to worry. The water pressure can reach up to the gutters and clean places that you find hard to reach. It will do it fast and easily for you. You can get the job done in half the time and have plenty of time to relax or get another job done in the same amount time that it would have taken you to?? you to clean the gutters without Power washers. Boats: Your boat can be washed easily and quickly with one of these machines. It will be able to clean off stubborn mold and mildew that can take hours of scrubbing to get rid of. Again, it can reach places that are hard to get at and save you from having to climb up and down on ladders. Aluminum siding: Stubborn mildew and grime can build up on the sides of your home. This not only looks bad but can deteriorate your home, and is a health hazard. You can easily get rid of all this with a Power washer. RV's: These vehicles can be hard to clean but you can solve your problems with one of these machines. It can power away mold, mildew and dirt, plus the spray will get to hard to reach places. Wheels are often hard to clean, but with one of these machines it is easy to get that stubborn dirt and get into all those little crevices. Cars and trucks: Can get dirty especially in the winter with all the salt on the road. Salt can also corrode the underside of your car. Without a power washer it is quite hard to get to this area of the car. However, these machines make it easy. When you keep your car clean you can prolong its life and save costly repairs. Car detailing: In car detailing one of these machines is a must. It will give you the results your customers expect and saves you a lot of time. You can get more cars done and increase your sales. Cleaning business: When you have your own cleaning business you can use portable power washers that can be carried easily in the back of your truck. They can easily be wheeled out for any job. It does not matter whether it is a fleet of trucks or a residential job, these machines are an important part of your equipment. Construction vehicles and equipment: These can be tough to clean but when you use one of these machines it will drive away the dirt quickly and efficiently. Keeping your vehicles and equipment clean will prolong their life. 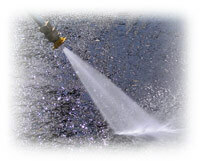 As you see a Power washer has many uses and can help you with any cleaning job. You can also check out electric pressure washers, wall mount power washers and many more. Different ways you can use your pressure washer to clean gutters with gutter cleaner. Learn how to properly wash your boat using power washers and commercial pressure washers.